Background: The rate of gallstone formation one year after gastric bypass is reportedly as high as 52.8%. One possible mechanism is the reduced cholecystokinin secretion due to diminished local enteric-endocrine reflex secondary to duodenal exclusion. Prophylactic cholecystectomy during Roux-en-Y gastric bypass (RYGBP) has been suggested to reduce the incidence of gallstone-related complications, but remains controversial. Purely restrictive procedures such as sleeve gastrectomy (SG) may result in less gallstone formation because intact gastrointestinal transit and entero-endocrine reflex are maintained. To our knowledge, no reports in the literature have analyzed the incidence of gallstone formation after laparoscopic SG compared to RYGBP. Materials and Methods: After IRB approval, a retrospective review of consecutive patients who underwent RYGBP (Group A) or SG (Group B) between January 2004 and June 2006 was undertaken; no patients received postoperative ursodeoxycholic acid. Patients with prior cholecystectomy, known gallstones with our without concomitant cholecystectomy, and those with prior bariatric procedures were excluded. Comparisons were made regarding the rate of symptomatic and complicated gallstone formation after surgery. Results: A total of 548 patients were analyzed; 496 patients were in Group A and 52 were in Group B. No difference in age, gender, number of patients with diabetes mellitus, and hyperlipidemia was noted between the two groups. Group A had a significantly higher preoperative BMI than Group B (48.5 vs 43 kg/m2, p=0.000). Additionally, more patients in Group A had a BMI >45 (54.0% vs 25%, p=0.000) and weight loss >25% of original weight (79.4% vs 25.5%, p=0.000), than Group B. Cox regression showed no significant difference in development of symptomatic (8.7% vs 3.8%, p=0.296) or complicated (1.8% vs 1.9%, p=0.956) gallstones between the two groups. 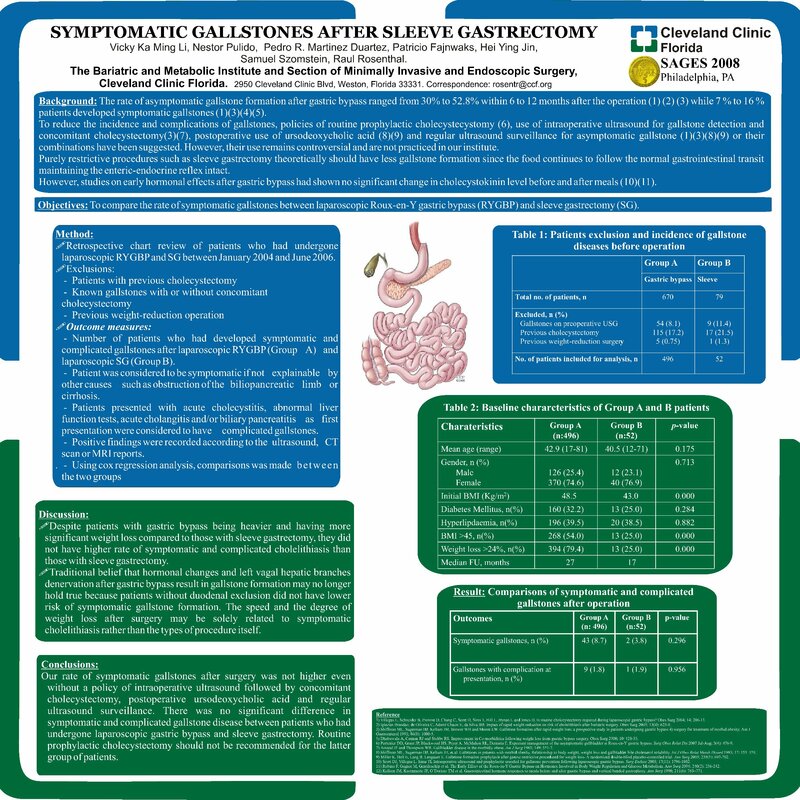 Conclusion: Laparoscopic SG does not increase the incidence of symptomatic or complicated gallstones compared to RYGBP.